I saw the new production of Shakespeare’s tragedy: Julius Caesar by the Bridge Theatre London. This new show is not for the faint-hearted, involving a significant amount of on-stage shooting, fighting and battlefield effects. My favorite characters are Gaius Cassius Longinus played by Michelle Fairley and Marcus Brutus by Ben Whishaw. Michelle Fairley performed marvellously. I was holding my breath many times during the show for both actors, fearing that they might forget a line or stumble. My concern was not necessary at all. As for Mark Antony and the young Octavius also known as Augustus, I have a lot prejudice against both men for their killing of my favorite Roman, Cicero. Nevertheless, one cannot overlook the achievements and historic impacts of Augustus. 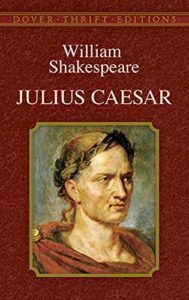 Julius Caesar, based on my readings of history over the years, is a character I admire and loathe with probably equal intensity. To this day, we use Julius Caesar and Augustus’s names to mark two important months of a year: July and August. We use the phrase crossing the Rubicon to mean passing a point of no return, taken from when Julius Caesar led his army across the river Rubicon and marched towards Rome, a declaration of war on the Roman Senate. How petty many of our struggles in life seem to be against the backdrop of the history of civilisation? To put things into perspective and to learn from the greatest is one benefit of my love for history, besides the immense joy it brings me. Spectacles are worn to correct my nearsightedness, history is read to broaden my vision. The lines from Shakespeare’s writing echo in my ears through the voices of the amazing cast of the show. Of all the wonders that I yet have heard. We, at the height, are ready to decline. –Not that I loved Caesar less, but that I loved Rome more. Had you rather Caesar were living and die all slaves, than that Caesar were dead, to live all free men? As Caesar loved me, I weep for him; as he was fortunate, I rejoice at it; as he was valiant, I honour him: but, as he was ambitious, I slew him. There is tears for his love; joy for his fortune; honour for his valour; and death for his ambition. Who is here so base that would be a bondman? If any, speak; for him have I offended. Who is here so rude that would not be a Roman? If any, speak; for him have I offended. Who is here so vile that will not love his country? If any, speak; for him have I offended. I pause for a reply. Mark Antony speaks to the Roman citizens with Caesar’s corpse presented at the Forum, stirring up the public towards a mutiny. You should read his whole speech. How very insanely cunning in influencing public opinions! Here is the excerpt approaching the end.